Thank you for selecting Wine Talks on your journey to learning about wine. We know that the most effective learning and appreciation comes through interactions. Rather than craft a book of written words on wine, of which there are many, we have opted to educate you through live conversations on wine. We discuss wine from many angles so you'll walk away with a solid grasp on how wine is made and how to buy wine, all the way to how to taste wine for maximum enjoyment. We break wine down by wine regions across the globe, from the New World to the Old World, with a point of reference in France, where most grapes have their humble beginnings. With the help of a few experts along the way, we talk about trendy wines that the restaurant sommelier's favor from offbeat regions to explaining why one of the smallest regions in the world, the Napa Valley, has spawned cult wines that collectors can't get enough of. We help you understand the primary flavors of each popular grape varietal and how they express so differently in various parts of the world. This is what makes wine so much fun. There's always something new to try. We also chat about the important aspects of serving wine, along with stemware, handling and storing wine for aging or just for tomorrow. Finally, we talk about the styles of wine, not just white and red, and the fundamentals of food and wine pairing. We then invite you to our Dinner Party where you can sit back and listen to how and why certain wine styles work with certain food styles. It's a guideline that will help you find the wines you like with foods you eat regularly. We then encourage you to have a similar party and your own group discussion to discover what you like best. Then please send in your newfound wine and food pairings to us. We'd love your feedback. 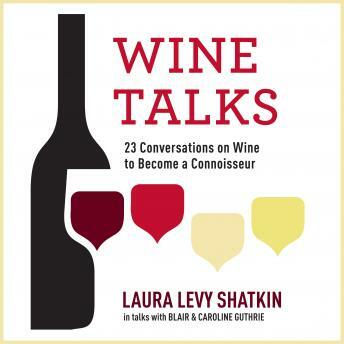 Our Addendum is full of wine tastings with the pros recast from podcast SommTalks.com. These put some of the lessons you've learned in Wine Talks in full action. You're only twenty-three conversations away from confidently knowing more about wine. Cheers and grab a glass!